The all new Canon imagePROGRAF PRO 1000 printer features breakthrough technology to provide creative professionals with unmatched quality prints. With 11-colour inks, including a newly formulated blue and magenta, plus the Chroma Optimizer ink, produce superior printouts on which dark blue areas are clearly defined to express your printed photography with the power of nuance. Achieve a wider color gamut and richer details in darker shadowed areas for the finest details in nightscapes and sunsets. Also change media types from glossy to fine art paper seamlessly with a dedicated nozzle for Matte Black and Photo Black. Anti-clogging technology is designed to eliminate white lines for consistently high quality prints. Ink ejection conditions are precisely checked with sensors, and when a blockage is detected, another nozzle automatically provides backup and compensates to provide a smooth, even flow of ink. In addition to reducing the possibility of printing failures due to banding, this also reduces the frequency at which head cleaning is required. By reducing unnecessary head cleaning you save valuable inks. 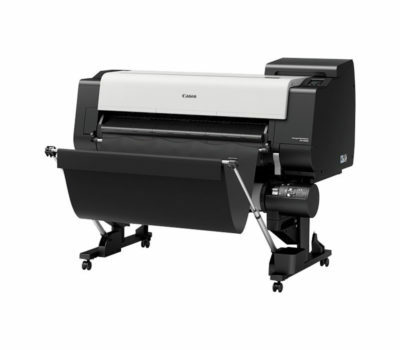 The imagePROGRAF PRO 1000 features Canon Air Feeding System to prevent each page from skewing and improves the precision of ink droplet placement. A series of openings located on top of the platen vacuum-grips the paper flat during feeding. The skew correction function guarantees that all types of paper, including gloriously thick paper, can be printed without misplacement as it is held tight to the platen with a vacuum grip, even in environments with factors of temperature and humidity. 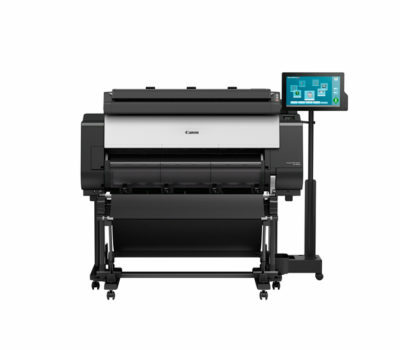 At the heart of the imagePROGRAF PRO-1000 is a 1.28″ wide print head. Expanding the printing area by 50% with each movement of the print head, print speeds are drastically improved. This increases your productivity through efficient high-speed printing. 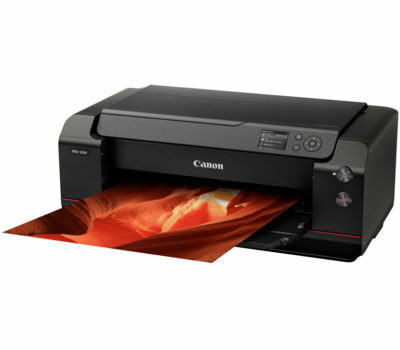 The Canon imagePROGRAF PRO-1000 printer features large capacity 80ml ink tanks to reduce the need for frequent ink changes and a simple-to-replace maintenance cartridge increase efficiency for high volume print users. All 12 inks are easily loaded from the front of the printer and are housed behind a flip down cover. Improve your productivity and efficiency with wireless and Cloud connectivity. Simply download the Canon PRINT app on your iOS or Android device, or print via your PC or laptop’s Wi-Fi connection. On PictBridge compatible cameras you can even print directly via Wi-Fi. The Print Studio Pro 2.0 plug-in software provides professional photographers with intuitive printing solutions. 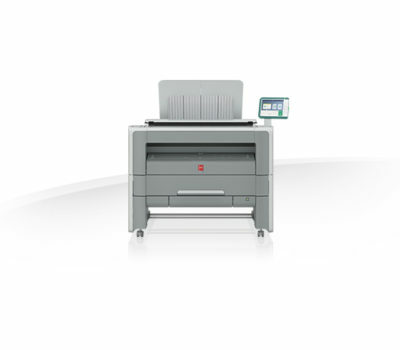 New functions added provide enhancements to your printing workflow. Every detail in your print must be perfect, why not have the same obsession for your workflow? The imagePROGRAF PRO-1000 is precisely managed with these powerful management tools.